ATP's chief nursery propagator Tigran Palazyan knew at a very young age that he would make a career out of growing and experimenting with plants. When he was a boy of 6–7 years old, his uncle set aside a plot of land at their home, brought him a truckload of fresh soil, and said "this is your area to do as you wish." Tigran grew up in Abkhazia. His family relocated there from the Black Sea's Hamshen region around the time of the Armenian Genocide. Young Tigran collected discarded flowers and replanted the cuttings, planted the seeds from fruit and vegetables eaten at home, and scoured the local markets looking for things to plant and soaking up tidbits of information from people in the business. Tigran became an expert on plants and growing virtually anything he could get his hands on. By the time he reached university and later a professional career in agriculture, Tigran had seen it all. ATP has been hosting visitors at the tree nursery in Karin Village for years, most recently with a series of organized monthly tours. Anyone who has met Tigran knows that he is a gentle and kind person, with a warm and engaging personality, even among people who can't speak any of his four languages (Armenian, English, Russian, and Hamshen). Visitors are immediately touched by his personality, passion for his work, and depth of his knowledge about plants. He has a knack for aesthetics and design, which is evident by the landscapes he creates at the nursery out of plants, flowers, stones, and soil for the sake of beauty and relaxation for visitors and the nursery workers. Tigran attended the top agricultural university in Russia in the late 1960s, and was allowed to do his practical studies in Armenia in the early 1970s. By the time he completed his doctorate in fruit tree production and viticulture (the scientific study of grapes), he was invited to stay in Armenia as they needed specialists of his caliber. Of course, he agreed enthusiastically, and began a career advising farmers on growing fruit trees and grapes. After the breakup of the Soviet Union, Tigran began working for a French organization doing relief work in Armenia around sustainable food production. The fledgling ATP was laying the groundwork for its first nursery in Karin Village in 1996, and several people referred him for the job of tree propagator (one who causes an organism to multiply through a process of natural reproduction from the parent stock). Karin was a new village constructed by the UN and Norwegian Refugee Council to house Armenian refugees relocated from Azerbaijan during the war. It was a barren landscape, and Tigran did not shy away from the task. He knew what to do, and he joined a team including many of the refugees in the village that built the nursery from the ground up by working the soil, planting the seeds, and expanding the production to an output of more than 25,000 trees per year. The nursery team now manages three CTP nurseries with the newest being in the wine region of Vayots Dzor. "Establishing the nurseries in the refugee villages of Karin and Khachpar was a challenge," says Tigran, "since most of the people were from cities like Baku, and did not have experience working with plants and soil. But they learned fast and with enthusiasm, and the nurseries have become a green oasis in this landscape. From early on, I was a believer in ATP’s mission. I love working with the soil, and seeing the results of my work. You plant seeds, and watch them grow. What else can you ask for?" The total output of the Karin, Khachpar, and Chiva nurseries is more than 50,000 fruit and decorative trees per year, which are replanted by ATP's Community Tree Planting team at sites all over Armenia and Artsakh. The Karin site, where Tigran spends a lot of his time, includes the Michael and Virginia Ohanian Environmental Education Center and two greenhouses where young trees begin their lives as seeds. ATP's most popular trees are fruit producing like apricot, apple, sweet cherry, and even some nut trees such as almond and walnut. 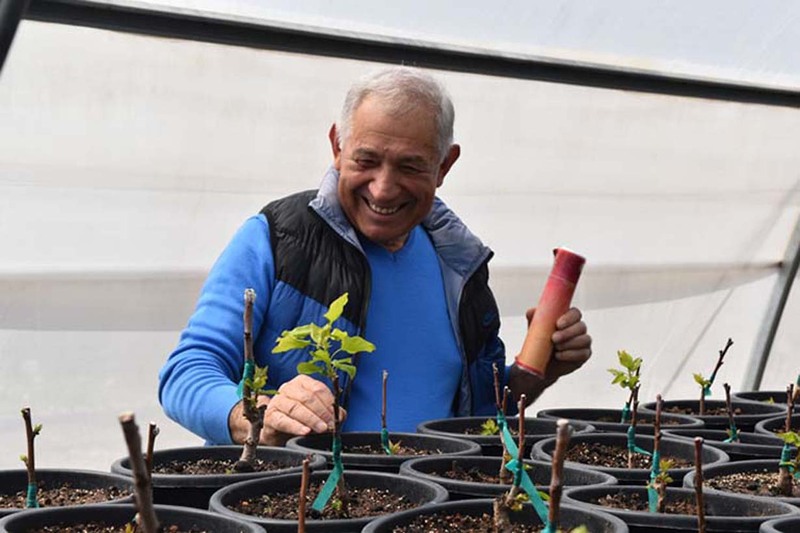 Tigran is a master at grafting trees to ensure the highest quality and fastest growing trees. The nursery team, led by nursery manager Samvel Ghandilyan, has been grafting trees in winter in order to speed up the growing time. In the past, ATP has received more requests for fruit trees than they can fulfill, so Samvel and Tigran are developing ways to improve the rate of growth and get more trees out to the communities. People gravitate to Tigran, and he is especially popular with children. During visits to the Ohanian Environmental Education Center at Karin, young people are mesmerized by Tigran's lessons and always enjoy the outdoor activities. He's featured in a short series of educational videos called "TREEvia." In these two minute clips, Tigran answers questions about why leaves turn colors, and how trees survive in winter. Tigran is a widower and has two daughters.